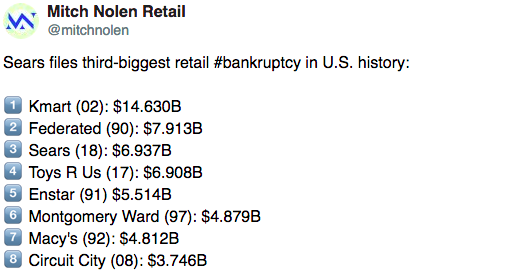 Early this morning, Illinois-based Sears Holdings Corporation ($SHLD) and approximately 49 affiliated entities (including KMart) finally filed for chapter 11 bankruptcy. The company lists a staggering $11.339 billion of total debts and $6.937 billion of assets. The well-known company has 866 full-line and specialty stores as of August 4, 2018. In its chapter 11 petition, it boasts of its legacy as an “integrated retailer with significant physical and tangible assets, as well as virtual capabilities enabled through technology.” Yes, you read that correctly: they actually say “virtual capabilities enabled through technology.” That right there may help inform EVERYONE why this storied retailer has found its way into bankruptcy court. To the last, Sears stands out for its ability to appear out of touch. The company appears to have a commitment for a $1.875 billion debtor-in-possession (“DIP”) asset-backed credit facility, including an increase of $300mm from its existing facility as well as an agreement over the use of the company’s lenders’ cash collateral. According to a company press release, the company is also negotiating an additional $300mm commitment from ESL Investments Inc. (“ESL”), the company’s largest shareholder and the investment vehicle of Eddie Lampert. 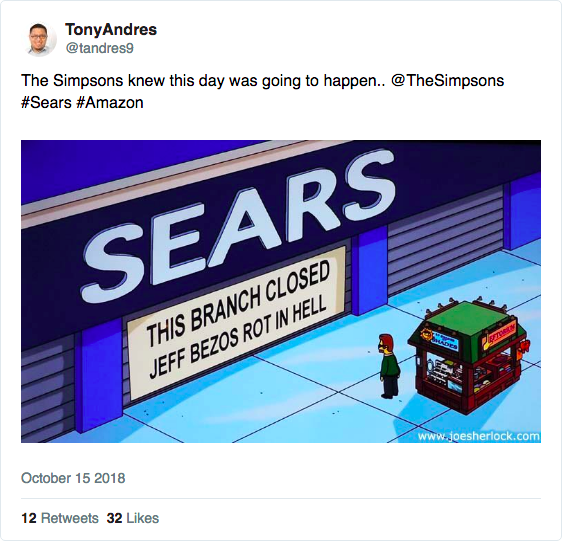 The company intends to reorganize around a smaller store platform of “EBITDA-positive stores.” To this end, the company will close 142 stores near the end of the year adding to the previously announced 46 stores set to close in November 2018 — potentially further perpetuating the hurt put on U.S.-based malls over the last several years. Meanwhile, the company continues to negotiate an asset purchase agreement with ESL for “a large portion of the Company’s store base.” This would, obviously, keep the enterprise from liquidating and potentially help maintain thousands of jobs: Sears currently employs approximately 90k people. While Eddie Lampert will remain Chairman of the Board, he has resigned as CEO of the company. Godspeed, Eddie. The company’s top listed creditors at the time of filing include The Pension Benefit Guaranty Corporation and various trustees under five different tranches of unsecured notes totaling over $3 billion in principal amount (BNY Midwest Trust Company, Computershare Trust Company NA, The Chase Manhattan Bank NA). Trade creditors include Whirlpool Corporation ($23.4mm), Frigidaire Company ($18.6mm), and Winia Daewoo Electronics America ($15.2mm). Indenture Trustee to Medium Term Notes: The Bank of New York Mellon Trust Company, N.A. PETITION is a digital media company that provides analysis and commentary about restructuring and bankruptcy. We discuss disruption, from the vantage point of the disrupted via a twice-weekly newsletter. Our Wednesday newsletters are free. Become a Member here to receive our robust Members’-only Sunday newsletter and learn more about the events affecting — in fact, restructuring — our society every day.